Stories about aggrieved Manhattan car owners in search of a parking spot are evergreen. On an island of 1.6 million residents, there’s only so much street space to go around — that’s never going to change. Parking a car was a pain in 1997, and it’s a pain today. But the city has changed since 1997. Two things Manhattan has today that it lacked 20 years ago are a bike-share system, introduced in 2013, and protected bike lanes, which have been spreading since 2007. The aggrieved car owner story hasn’t been the same since. Instead of getting angry quotes about the evil Parking Violations Bureau or merciless meter maids, reporters can stick a mic in the face of someone behind the wheel and ask about bike lanes. This type of segment was all over the airwaves six or seven years ago then faded away, before NY1’s Michael Scotto revived the genre with this week’s “No Parking Anytime” series. In 1998, there were 810 lots and garages south of 60th Street, with 112,826 spaces. By last year, there were just 643 facilities and 95,000 spots, a decline of 16 percent. This as Manhattan’s population surged by more than 100,000 people. These are some interesting stats on parking. If you take away the motorist grievance and add a bit more context, the numbers speak volumes. There are 2,330 fewer on-street parking spaces in Manhattan to make room for bike lanes and bike-share (DOT cautions that this is based on curb footage and overcounts actual parking spaces, but that’s okay), and the number of off-street parking spaces in the central business district has fallen by tens of thousands in the past two decades. More people: From 2000 to 2015, Manhattan gained 108,000 residents. The rent may be high, but those 108,000 additional residents are keeping housing prices from becoming even less affordable in the rest of the city. More employment: The number of jobs rose by about 130,000 between 1998 and 2012. Fewer traffic injuries and deaths: From 2009-11 to 2013-15, the annual average of serious traffic injuries and fatalities on Manhattan streets fell 12 percent, from 683 to 601. These relationships are no coincidence — cars take up too much space and parking gums up the works for everything that makes New York City tick. You can’t have abundant housing if every apartment has to come with a parking space, and you can’t have good streets for walking, biking, and transit unless you’re willing to reduce the number of curbside parking spots. More housing, more jobs, safer streets, less parking. Let’s keep it up. Can you link to the calculations/website/study used to determine the square footage used per mode of travel? That would be very helpful! The million dollar question I would love to ask people like Mr. Bowman is why bother owning a vehicle in the first place when all they ever do is move it on alternate parking days? Do people like him actually use their vehicles regularly for trips where a car might make sense (like going outside NYC to areas with no public transit)? Or are they so afraid of losing their precious parking spot that they never use their vehicle at all? It’s a question which merits an answer. If the majority of Mr. Bowmans out there just move their cars on alternate parking days perhaps the city should reapportion that space for something more useful, like loading zones, instead of wasting it for people to use for what amounts to a security blanket. The idea of owning and keeping a private automobile in Manhattan is frankly ridiculous. If you must own a car, why not just park it outside city limits? Probably faster to take mass transit to your car whenever you use it for out of town trips than to drive into Manhattan and find parking? Just the 2,330 vs. 18,000 is enough to wonder where all the bike hate comes from. I guess it comes from people who don’t want to pay. There have actually been some liberalizations in the amount and use of off-street parking in Manhattan over 20 years. New residential buildings are now allowed to have some in the CBD, I seem to recall, after them having been banned for some years. And the “accessory parking” idea has been done away with, meaning garages can legally rent to anyone, not just building occupants. Area used per person for a mode of travel is interesting. 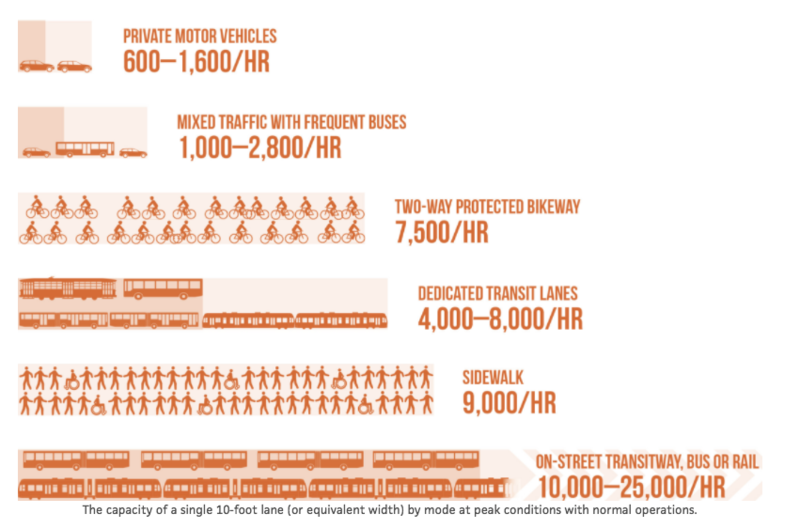 But to get the complete answer of the amount of street space used to travel, you have to divide by the rate of travel. Once you make this correction, the automobile is still the least space-efficient means of transport in a city — but it becomes clear that the bicycle is the most space-efficient. The idea of “middle class New Yorkers” is a little obscene when you’re talking about Manhattan these days. Has rent control produced a situation where a lucky few can “afford” to rent a Manhattan apartment but can’t afford to keep a car at it? Am I supposed to cry a tear because street space isn’t also provided to them at below-market rates? Remember that MOST middle-class New Yorkers live in the outer boroughs or suburbs, where market-rate housing prices are affordable to the middle class. If we have cars (most of us do), we don’t bring them into NYC and expect free parking. I think you hit the nail on the head regarding rent controlled apartments. Those who inhabit them also tend to be long-time residents who perhaps had better reasons to drive everywhere back in the 1970s when transit was unreliable and crime was rampant. Their low rents give them the surplus income to be able to afford cars. As if that wasn’t enough, they still expect the city to provide free car storage for them. After decades of driving everywhere, they just can’t imagine traveling any other way. Unfortunately for them, the city is finally starting to realize it’s under no obligation to provide space for these people’s security blankets. That still doesn’t prevent them from complaining about it very vocally given the chance. Many of those in rent-regulated buildings in Manhattan have second homes, according to anecdotal evidence. They need their cars to get to them. Which is why I suggested that one use of that Yankee Stadium parking garage is long-term car storage for Manhattanites. They could take the B/D from the West Side or the 4 from the East Side, get in the car, and drive Upstate. I thought Bike Snob’s car registration figures were really eye-opening, and something that should be used as a reflex response to those complaining about loss of parking spaces. Perhaps Japan’s solution, as described on Streetfilms, should be pushed harder, whereby someone registering a motor vehicle has to PROVE where it will be parked. Of course since Cuomo controls the DMV registration apparatus, good luck getting that passed. That would make a lot more sense than dealing with Manhattan traffic, plus circling the block endlessly to find a spot. By some accounts half the traffic in some parts of Manhattan is people hunting for parking spots. The second-home issue is a big one, whether your apt is rent regulated or not. You want a car to get you and your stuff there quickly and efficiently, and to have the car there to get around. The long-term parking idea is met with a groan by many, as it means carrying lots of stuff (and kids) on the subway, bus or taking a taxi to the car in rush hour (Friday evenings). It would be great if more weekend destinations were transit-friendly, and people aligned their cargo expectations accordingly. It would be helpful if the transit to these place AND the transit within these places actually existed and operated on weekends and nights. As for the latter, transit in the suburbs evaporates on nights and weekends. That infographic has again been making the rounds, and it hurts the cause every time it’s shared. Because how on earth is one supposed to interpret it without a very long explanation? Isn’t the point of an infographic to clarify information? 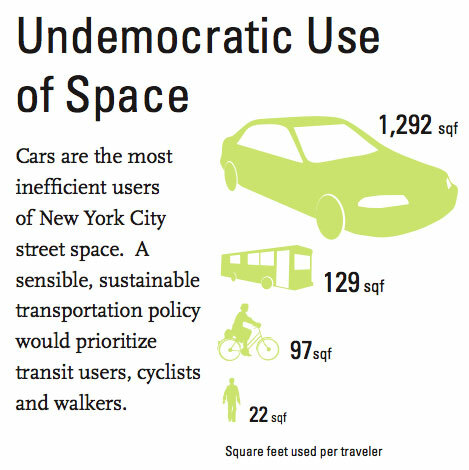 The easiest takeaway from this is that a car takes up 10 times as much space as a bus. Which is dumb and confusing. Everyone’s seen the photos of people representing the different modes. That campaign and its derivatives are powerful and intuitive. This infographic needs to die. It doesn’t need a long explanation. It just needs to say the space is “per traveler”. Oh, wait, it already does. That said, I agree that those photos you refer to are more effective at making the point. I would argue that rather than focusing on how awesome biking, walking, transit, etc is (and it truly is), we’d do better to simply point out to people driving that the biggest single competition for “their” spaces is *other drivers*. Look at basically every street in NYC, nearly every bit of curb space is occupied by…vehicles. To the extent that something like bikeshare or bike lanes “take away” parking, it marginally decreases the ease of driving/parking, and thus pushes more of the people choosing (as opposed to “needing”) to drive to give it up and removes competition for spaces. Therefore, if someone “needs” or even just really, really wants to have a vehicle in the city, that person should be pushing *for* more bike lanes, bikeshare, transit lanes, etc. If your going outside NYC to areas that don’t have public transit, only on rare occasions then, just rent one. Take a taxi to the rental place, stuff your crap into the rental, and go. In a orwelian world the government would do away with cars because it does not need the $ from taxes, less cars would also meen less people employed to make the cars that nobody needs. Less wages to spend on other goods and therefore less money in the economy money spent on fuel, coffee, food all fails to matterialize. When you force an economy you have to think it through.